• There are so many scenarios where Lotus Notes users find ultra need for NSF file migration into MSG files. Sysessential for NSF to MSG software works aptly in such conditions. NSF to MSG Converter Features Fully explained for you!!! The application ensures for maintaining metadata in prim and proper manner. The tool converts email data by utilizing advanced algorithms. It hardly make any changes in original data structure at all. If you are eager to know all about software prior making purchase of the software then download free of cost trial run now! 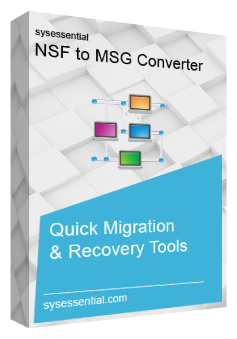 This will provide you vast idea how software performs data migration from NSF onto MSG. Also, this provides you fair idea of conversion method as free trial will convert first 10 emails from Lotus Notes. The software is systematic in approach and this is why when you move email data from NSF into MSG, it converts all the folders systematically. The tool ensures that no data loss ever occurs and data is migrated safely from one end to other. If you are very particular about data and do not want to migrate less important NSF emails into MSG then you can make a selection of those emails which you want to migrate rather than all the emails. Sysessential for NSF to MSG converter is designed with simple user interface. User feels unrestricted while migrating data from NSF files. The advanced features do not make data migration a challenging task rather it makes work systematic and easy. The proviso for batch data migration is all supportive of saving lots of time. It is indeed an excellent feature which aims at saving immense of the valuable time. User will be able to catch the preview of the NSF files before saving the converted data into MSG file format. This helps to have complete access to the emails prior making data migration. One can check out the emails and then proceed further. Is software provides the facility to demonstrate the application once purchase of the tool? Yes, just like other software applications from the company, this application is supportive of showing the conversion of first 10 NSF emails into MSG file format. Other than, this will give you complete idea how software functions and what sort of features are used. How software maintains folder hierarchy? The tool is particular about folder maintenance and this leads to keep folder hierarchy maintained. Even when emails are in bulk, it supports for migrating the emails into MSG in a systematic and up to the mark manner. The latest features added recently ensure for accessing folders in the right hierarchical order which in turn keeps data in an apt way. Is person will less technical knowledge able to make data migration? Yes, Sysessential for NSF to MSG converter uses advanced techniques but sill even a person will no or less technical knowledge can utilize it properly and effectively. The results will be the best for sure. Is tool workable with all Windows versions? The application is supportive of working with all the MS® Windows OS versions including XP, Vista, Win 7, 8.1 etc. Hence Windows edition will not affect the working of the software at any point. How many steps are involved for making data migration? The tool ensures that users use minimum possible steps. Thus, bulk migration or export NSF to MSG gets over only in few easy steps. The process will not pinch in any way time pressed users. I must say that Sysessential for NSF to MSG converter is an amazing utility to use. It is so organized and systematic when it is to convert bulk NSF files into MSG file format. I have never got the chance to work with such a patent and extraordinary application. In fact, I would like to recommend to others as well when it is to use for migrating bulk NSF emails into MSG files format. Try it once and you will be mesmerized with its features set.